The new Sys*Stim® 228 neuromuscular stimulator featuring four discrete waveforms designed to facilitate clinical versatility. 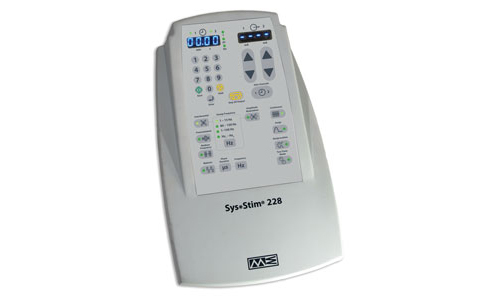 The Sys*Stim 228 provides the flexibility to meet virtually any clinical need and has unprecedented ease of operation. Clinicians can choose from a broad range of waveforms, including Interferential, Pre-modulation, Medium Frequency (Russian Stim) and Biphasic with adjustable phase duration and frequency. Additional versatility is provided by a selection of treatment modes that include Surge, Reciprocation, Surge with Reciprocation and Vector Rotation.